Here's an English essay with easy wording on my pet topic and you can read it or download for reading later. 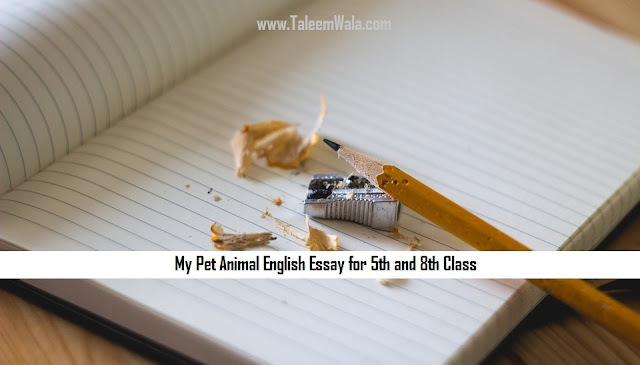 Here is the My Pet Animal (Dog) English Essay for 5th and 8th Classes in Pakistan. So read it out and easily impress your teachers. a short tail. It is a shaggy animal. It runs very fast and I take it for a long walk everyday in the morning. It likes to eat meat and fish. It likes to drink milk. It loves to play with ball. It is very active and is always on the alert. It never lets the unconcerned people to enter the house. It does not bark on the beggars. It guards our house with agility at night. In the morning, I give it a delicious breakfast. I give it a bath after a couple of days. family members like it very much. If you want more 5th and 8th class essays in English then search on our website and stay connected as we are going to update it with more essays.